But before i fell for bait, i noticed some pointers that saved me. Some malicious hackers are on the lose and cyber crime is on rampage these days. This could save you or somebody else you know. If this email was legitimate, the sender’s email should have come from Google, and not from some domain name(system-support.com) i’ve no idea about! An email from Google should have been something like “support@gmail.com” or “system-support@gmail.com” or “privacy@google.com” but not “Privacy@system-support.com”. This was the first clue i got that this was someone attempting to hijack my Gmail account. Then i read the content of the email which had a lot to be desired too. For starters, while i use different devices from multiple locations to access my Gmail account, i’ve never received an email message from Google complaining about multiple access of my account from different locations or IP addresses. The message doesn’t even have a signature(well, that can be forged too) like “© 2013 Google Inc. 1600 Amphitheatre Parkway, Mountain View, CA 94043” indicating that this was an official email from a corporate organisation. Last week, i received an email from Google about its final roadmap on shutting down Google Buzz and how to export my data off the decommissioned service. With that, i could tell a striking difference. When i clicked on the “click here” link just for the sake of it, again i could tell from the page URL that this is a hacker. The page URL, http://www.thecloisonne.com/extras/Gmail/Gmail.htm again doesn’t have a Google domain or submain domain name in it like say “privacy.gmail.com” or “support.google.com” or something similar! Instead, the URL has a domain “www.thecloisonne.com” that has nothing to do with Google. Plus the page isn’t a standard secure page with the “s” on the “http” part of the URL. 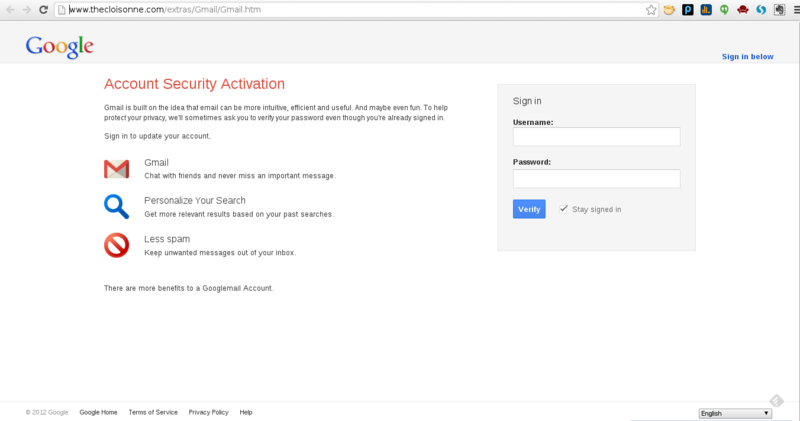 Of course the unsuspecting user can easily fall for this because the login page looks almost like the legitimate Google login page. Many innocent people keep falling for these kinds of Hacks. However, all you need is a little more vigilance and care and you won’t fall victim of such cyber crime. The webiste is now blocked by Google Chrome having been reported as a Phishing Website.